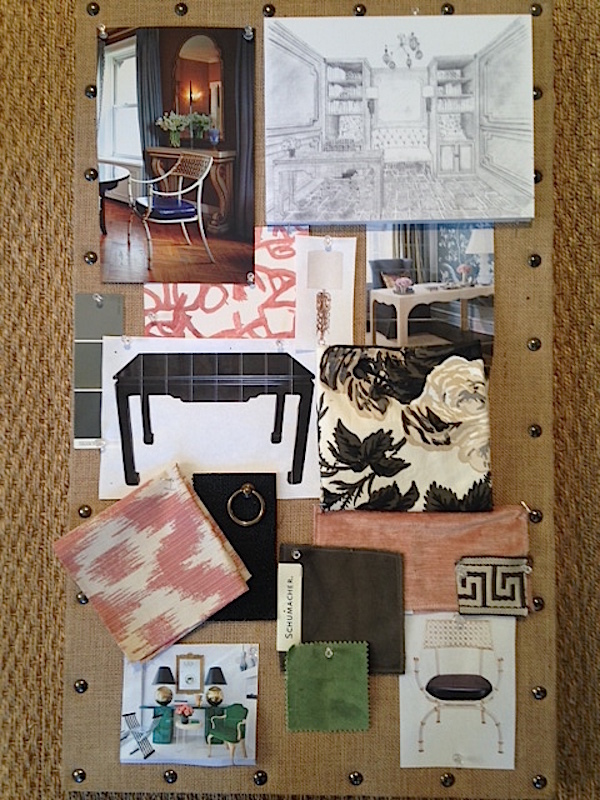 You can see on Jenny’s original mood board how her inspiration evolved into her fully conceived vignette. 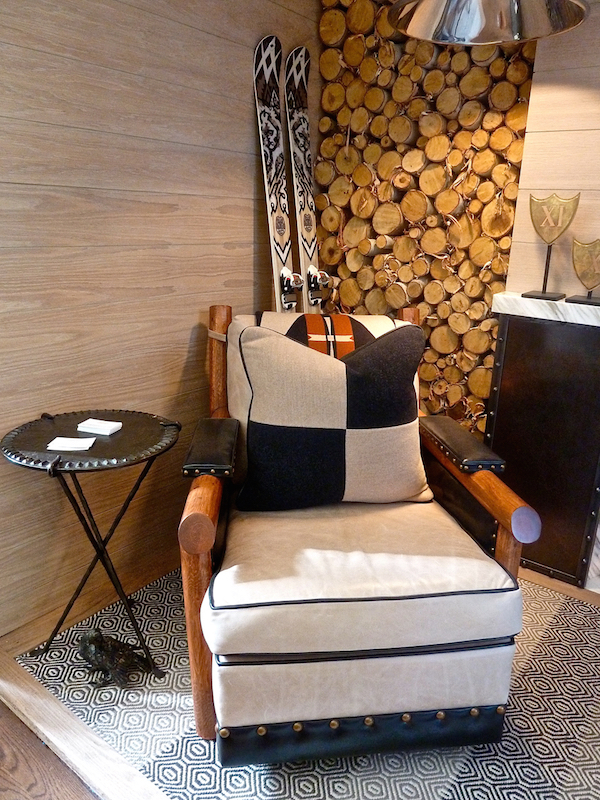 Amanda Nisbet’s Cielo Arm Chair for Niermann Weeks, with its contemporary white metal finish and classical allusions was a curvy complement to the handsome black lacquered grass cloth desk with brass framing that Jenny designed specifically for the space. 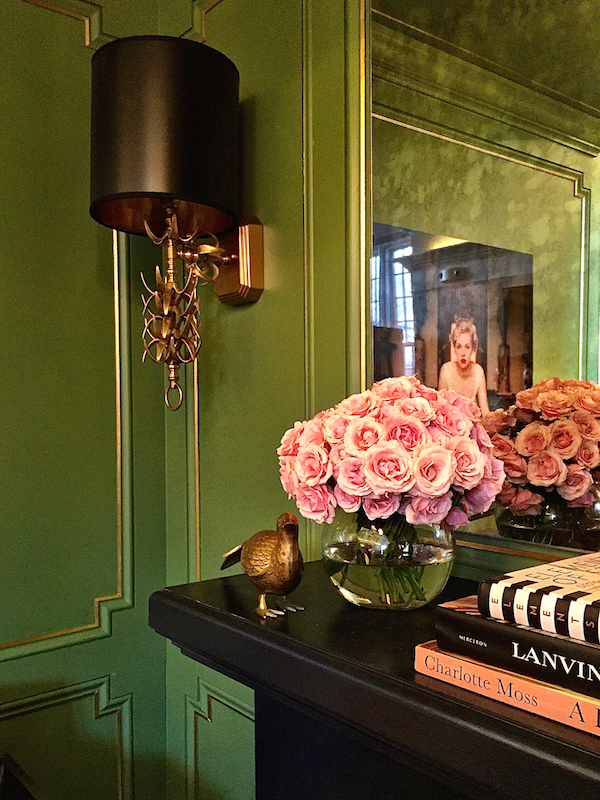 The brass detailing is echoed in the Ro-Sham-Beaux palm sconces, above, and Serena and Lily’s Alabaster Lamp furthered the contrasts of texture, shape and materials. A custom bench from Thibaut in a blush linen was bedecked with pillows echoing the vignette’s bolder elements with a feminine touch and special significance. 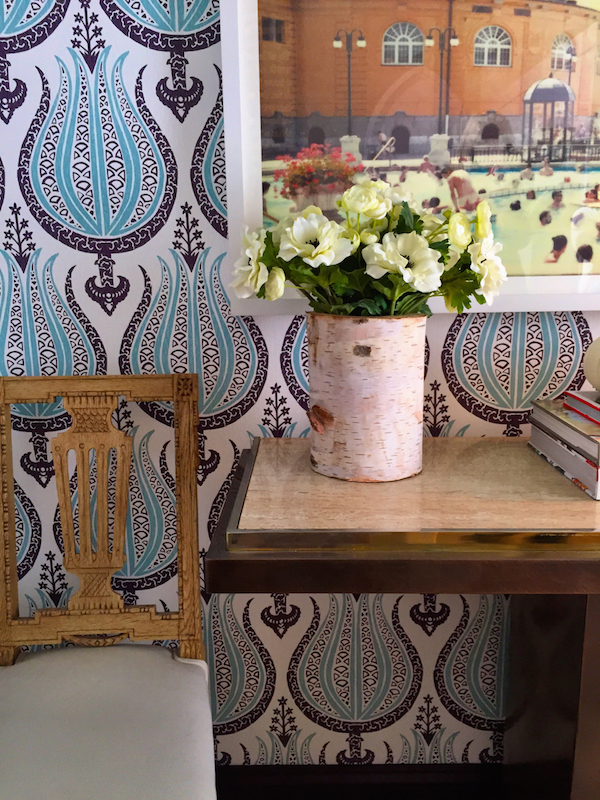 Schumacher’s black and white floral chintz Hollyhock was first used in 1962 by Albert Hadley for his client Mrs. Pyne – a lovely nod to the event’s founder. 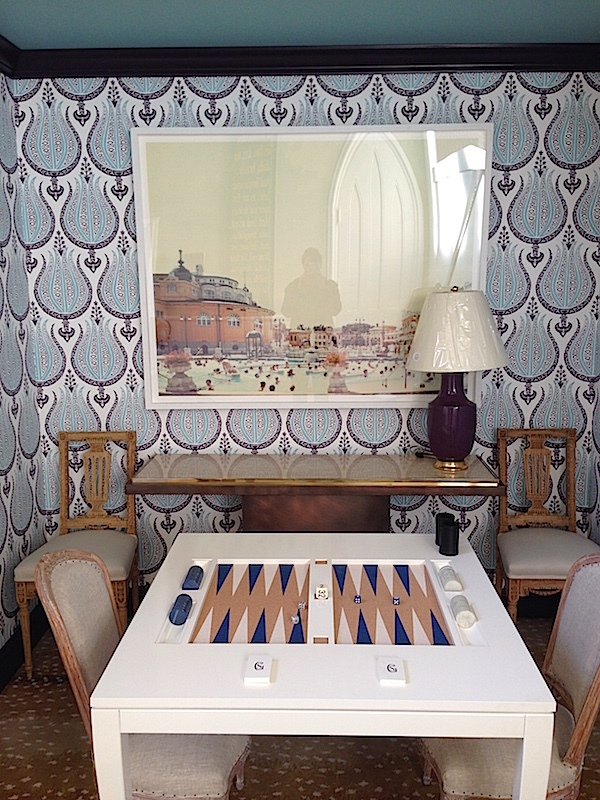 Even the art presented an appropriate contrast between traditional and modern. The custom framed intaglios, on blush linen, were an understated and refined contrast to the sexier expression of femininity in the Slim Aarons print from Jonathan Adler above the desk. I’m sure Jenny could certainly use a comfy place to repose when at work – wishing her all the best with her latest addition to her family! Yes, please! I think I would be much more inclined to brave the slopes if I knew I was returning to this enveloping space. 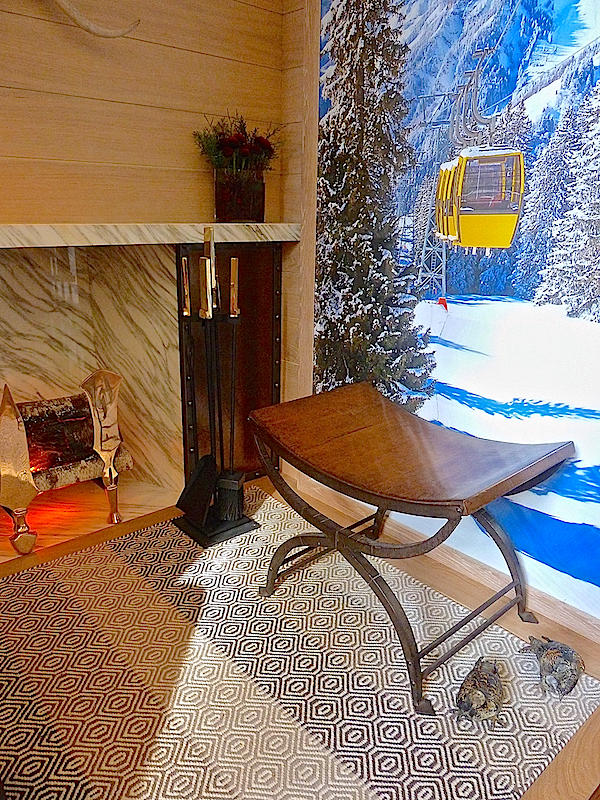 You can see how the original rendering for the room morphed into a more luxurious version of chalet chic. With a marvelous melding of rustic and elegant elements, the designers created a space exuding comfort and sophisticated style. 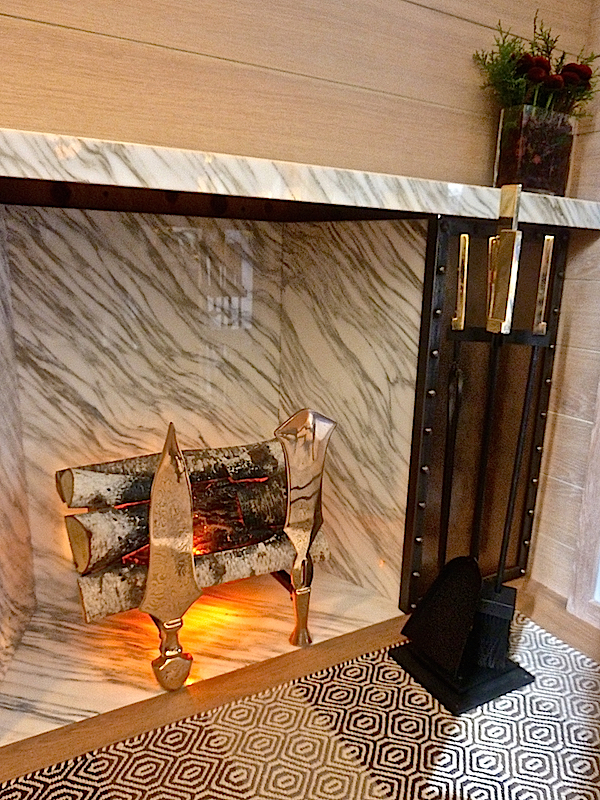 “We envisioned that our occupants were just returning from an arduous day on the slopes and with the chill beginning to creep up on them the inclusion of a fireplace was paramount.” Their rendition was of beautiful grain matched marble, edged with contrasting bronze panels with bold rivet details and accessorized with gorgeous sleek fireplace equipment from John Lyle. 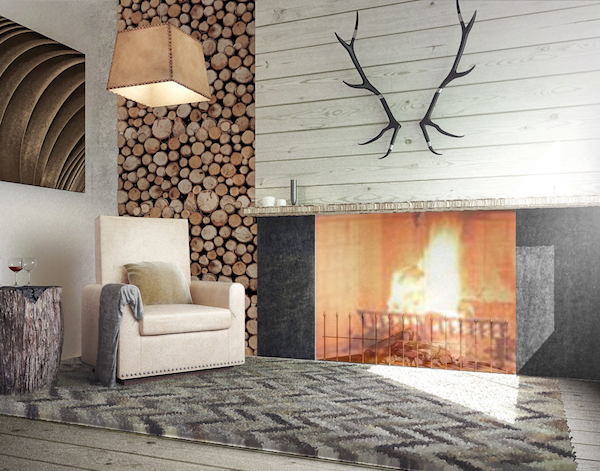 “We employed an array of textures to achieve our refined rustic feel. The khaki, brown and ivory inlay rug (from L&M Carpets) reminds us of a cozy wool sweater and softens the sophisticated marble fireplace and sleek bronze andirons.” Paul Ferrante‘s wonderful leather and steel hanging light fixture (in top photo), side table, above, and curved bench below contributed a sophisticated handcrafted sensibility. And cast doves from Holly Hunt added an artistic element from the natural world. I think Raymond and Christina were ready to brave the winter in style. 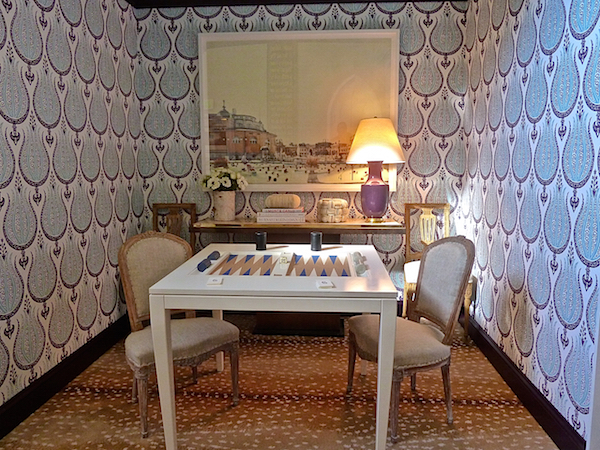 Like Patrick Mele, Sara Gilbane‘s room got its inspiration from her fabric collaboration with Peter Fasano. For her vignette she reworked her Gypsette into a multi color version wallpaper. The multi-material console walks the line between old and new. 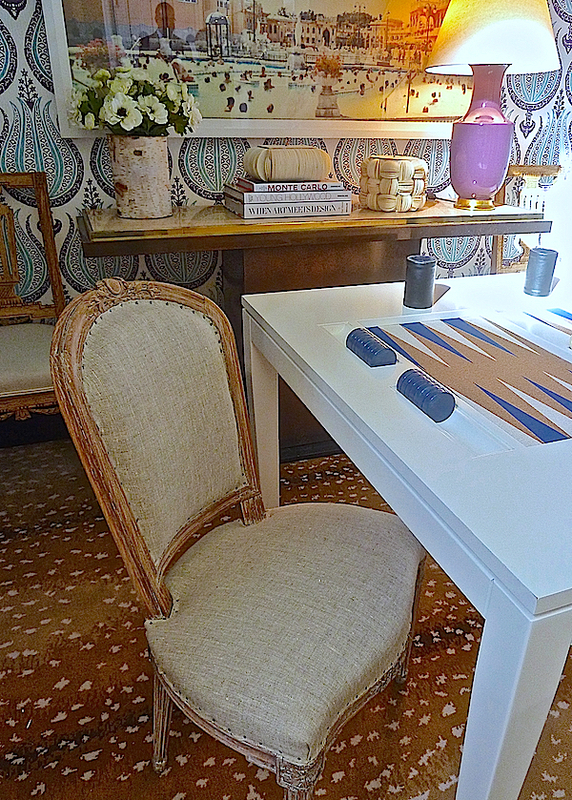 With clean spare lines, it feels contemporary but is in actuality a French piece from the ’70’s. 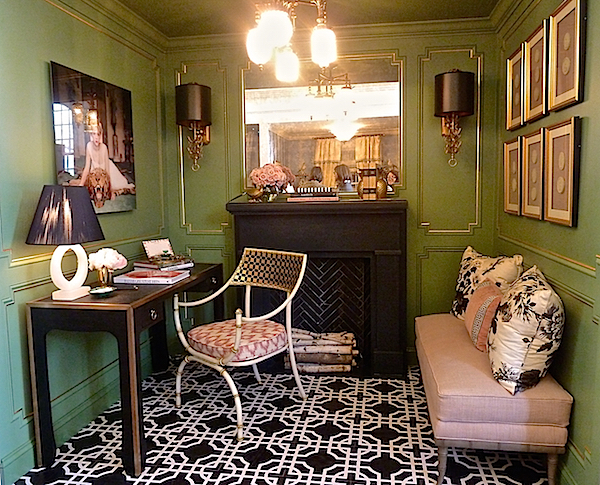 I loved seeing how Sara has now taken Gypset to its next incarnation. 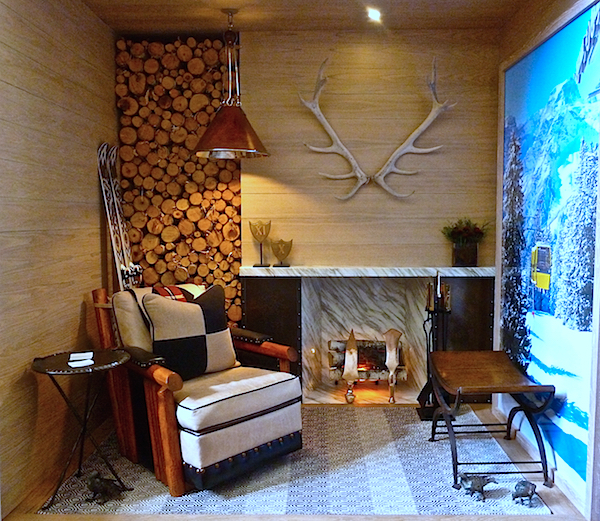 It really makes the space and shows how versatile such a large scale pattern on the wall can really be. I’m sure Sara would agree. 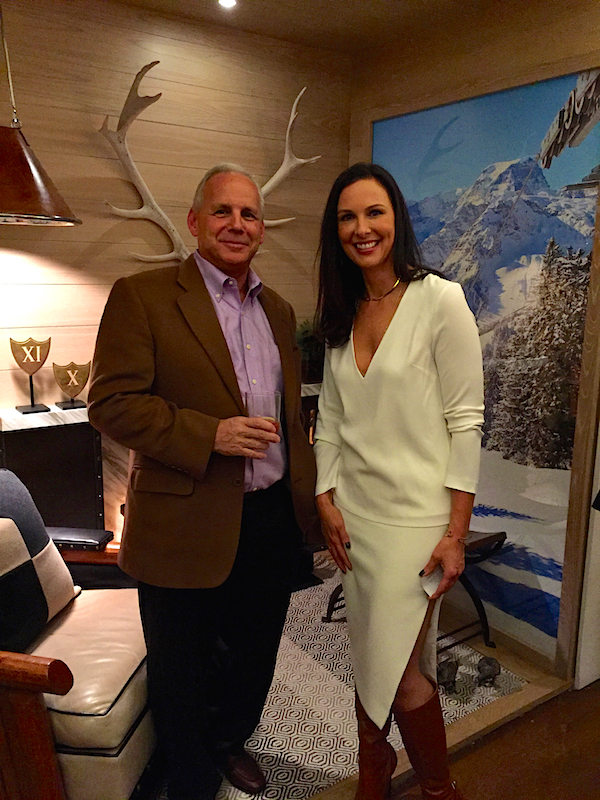 Stay tuned, there’s lots of great design coming soon – more vignettes from Rooms with a View and a behind the scenes video visit with several of the designers as they prepared their rooms at this year’s Holiday House fundraiser. 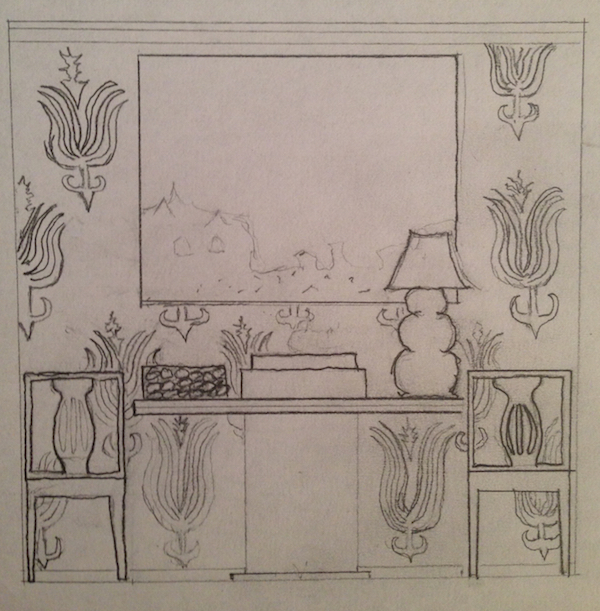 This entry posted in interior design. 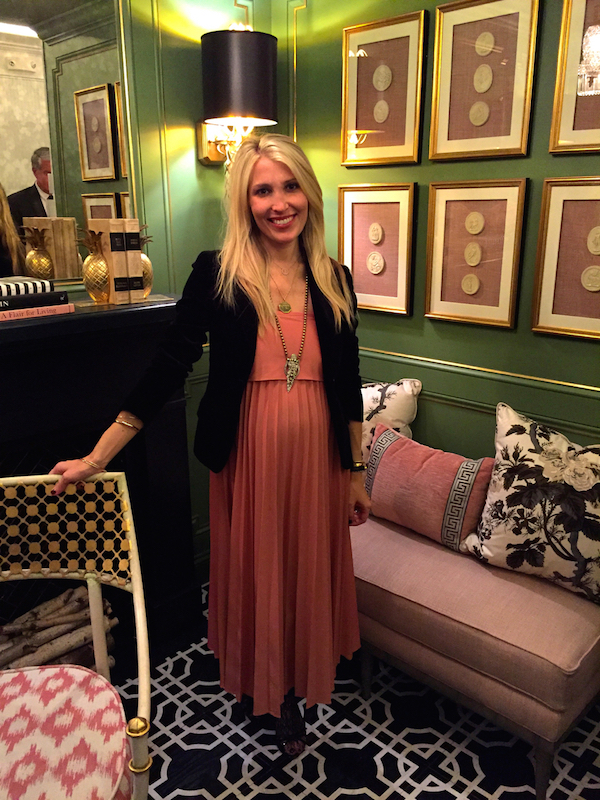 Entry Tags: designer showhouse, interior design, Rooms With A View Bookmark the permalink. My maiden name is Molesworth, hence an affinity for Thomas Molesworth’s style. I spotted that chair straight away. That might go on a Christmas wish list. The lead off room is divine. From the initial plans, I would never have thought Calke Green but it’s perfect. Loving the way the black plays off of it. Wonderful post! 80 queries in 0.553 seconds.